I just finished watching the first episode of Diva Hits the Road 3 and I can’t stop smiling at my screen! It is too short, I need more. Soon. This entry was posted in > China, - Variety Show, First Impression, Recap, Thoughts and tagged Chen BoLin, Diva Hits the Road 3, Divas Hit the Road, 花儿与少年 第3季, Guli Nazha, Jiang Shuying, Jing Boran, Lai Yumeng, Maggie Jiang, Song Zu Er, Tony Yang, Yang Youning, Zhang Ruoyun on May 3, 2017 by Kate - skimmedmilkdrama. 1 word: wow. I loved the past 2 seasons (irrationally, if I must add) and when there were no new seasons in 2016, I thought this show was not going to be renewed anymore. Jing Boran, Chen Bolin, Tony Yang, Zhang Ruoyun, Jiang Shuying, Song Zu’er, Lai Yumeng and Guli Nazha will all be participating this season. The new cast are relatively young. Maybe from season 2, they have learnt that their concept just doesn’t work well with older people who are not as physically fit and energetic. Plus, loads of the audience preferred the previous cast without Mao A’Min and Xu Qing who simply couldn’t fit in the relatively younger crowd who had amazing chemistry and were lovable. This season, we have 8 cast members instead of the usual 7. There is an equal split in gender as well so we do not have 1 (or 2) poor guys moving all the overweight luggage for everyone all the time. With this set of cast, I wonder if they are going to try to match them into CPs throughout the season. I will not be surprised because they did that in season 2 (Jing Boran-Zheng Shuang and Yang Yang-Ivy Lee) even though Zheng Shuang and Yang Yang is now THE couple to ship because of the great drama that was Love O2O (ha! the producers then must be crying now). I’m not sure how that would change the dynamics of the show though so I’m pretty wary about it for now. Jing Boran wasn’t my favourite member from last season (even though people did like him when he was the guide so he didn’t fail too miserably). I’m curious to see what kind of role he will play in the new season, especially since other participants are all from the same generation and not ‘elder sisters’ whom might spoil and give in to him for his boyish charms. Will he continue to be the guide and bring everyone along (something that he doesn’t actually really enjoy doing, shared from his interviews from past seasons) or will he fade more into the backgroun and let the older people set the tone even though he is more ‘experienced’? The two taiwanese actors, Chen Bolin and Tony Yang, are both faces that I’m quite familiar with. Especially our dearest Li Da Ren-ge, Chen Bolin, from In Time With You. I’m thinking he will be like the Ivy Chen of season 2. I actually haven’t seen much of the both of them outside of acting, so I’m definitely looking forward to that. As for Zhang Ruoyun, I have recently watched him for the first time on Fifteen Years of Migratory Birds. It seems like he is pretty famous and a lot of people like him so I would like to find out his charm too. I saw Jiang Shuying in the movie So Young and the drama, To Be A Better Man. She was quite pleasant to watch and it seems like she was under a lot of fire for bad acting for a period of time but she got over them and became stronger. That alone made me have good vibes for her so I’ll be looking out for her. I have never heard of Song Zu’er and Lai Yumeng so I have no expectations for them. Last but not least, Guli Nazha. I had seen her when I watched a couple of episodes of Up Idol and also heard of many negative rumours of her too. I am sympathetic, yes, but I’m a bit skeptical and do not feel much for her. I will be going in this show with an open mind and form a full impression of her from here. And yes, Guli Nazha is the girlfriend of Zhang Han, the original tour guide in Season 1. Zheng Shuang, the relatively new ex-girlfriend of Zhang Han (at time of of Season 2), was the original tour guide in Season 2. In season 2, she and Jing Boran, who just co-stared in Love Through A Millenium with her, were heavily sold as a CP. And now, in season 3, we have Guli Nazha. Even though I doubt she will be made the first tour guide of this season since I think she is not as well known as some of the bigger names and they will probably let a male take charge, I will not be surprised if it happens. This show has no boundaries. They really exploit the worse nature of human and feed the audience with the poison they want. The show have no qualms about using controversial people, rumours or gossips to promote their show even though we all know, actors are humans too and they should be led to live their own lives. I always felt it borderlined on being trashy, with the conflicts and ugly they intentionally create and the gossips/rumours they try to leech off. I can’t really respect the production nor editing team for this show but I have to admit…. I enjoy the drama they create and I follow the show like a cult. I’m sorry, but I am yet another scum audience who want to see celebrities destroying their image as they tear each others’ hair apart. Season 3 of Divas Hit the Road 花儿与少年: 冒险季 features a new and younger cast in Jiang Shuying, Bolin Chen, Guli Nazha, Zhang Ruoyun, Tony Yang, Song Zu’er (as Nezha in Lotus Lantern 2005) and Lai Yumeng (new actress who made her debut in Go! Goal! Fighting! ), with Jing Boran as the only returning cast member. 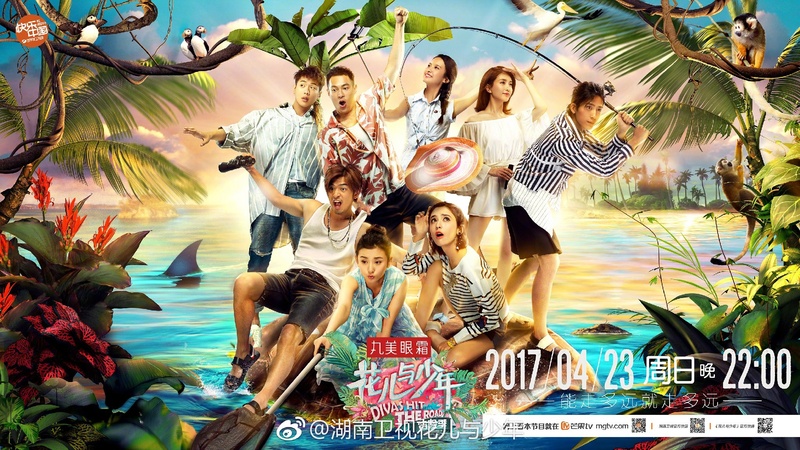 This entry was posted in > China, - Variety Show, News, Reblog, Thoughts and tagged Chen BoLin, Diva Hits the Road 3, Divas Hit the Road, Guli Nazha, Jiang Shuying, Jing Boran, Lai Yumeng, Song Zu Er, Tony Yang, Zhang Ruoyun on April 21, 2017 by Kate - skimmedmilkdrama.